Since Donald trump’s was indicted as the America’s forty fifth president, one question has been on everyone’s mind and that is whether a decade old immigration proposal will finally be enacted. The driving force behind Trump’s campaign was to curb legal immigration under the garb of improving the integrity of America’s National security. What is the philosophy behind this bill? 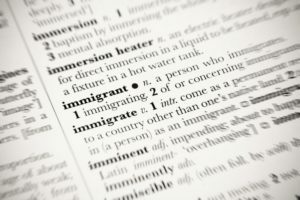 According to Trump’s office, this bill is being enacted to eliminate the current immigration structure and to replace it with a unique point-based system in order to reduce the number of legal immigrants in America. This point based system will not consider the benefits of family unity and the various needs of American employers. Furthermore, the Congressman Lamar Smith has recently introduced immigration in the National Interest Act (H.R 3775) in order to provide the Raise act a legal paradigm and a companion bill. What will this bill achieve? However, there is no doubt that this bill is a targeted attack on the current legal immigration system as it is introducing an array of stringent requirements which are essentially contrary to America’s ethos. Applications will be refused immigration without even considering the impeding needs of American employers and the value of families who consider their immigration as their lifeline to start fresh! There is no doubt that this bill is completely neglecting the fact that legal immigration is one of the most integral contributing factors towards America’s economic stability. This bill will rip families apart by forcing them to live far away from each other and is contaminating the ethos of America which is renowned all around the world! So, it is safe to say that immigration will be denied immigration without even considering family reunification and the needs of the current American Eco system. What are the details of this bill? Why is this bill so controversial? This bill has stirred an outcry from the American society as it clearly will have a detrimental impact on the economy and is contradictory to the ethos that our society has cherished for decades now. Furthermore, family based immigration has always contributed to expedited business development and has helped create communities which have created an environment which is sufficient for local business to thrive in. If that’s not enough family based immigration has also helped fuel innovation at an exponential rate for years now, for example a substantial number of businesses in Silicon Valley are owned by individuals who have family based visas. At the same time, if employers in America are denied access to foreign employees, many companies will have trouble creating a foothold in the market or achieving growth. This narrow and rigidly based point system will also deny universities the liberty of teaching students who deserve a chance to create a fulfilling life for themselves. The RAISE act will also eliminate the number of skilled workers in the economy which will further dampen the progress of our society. Finally, this bill will have a negative ripple effect that will affect the economy from many different aspects and the consequences may prove to be permanent!